Why is it that the older we become, the less questions we ask? Yes, children may be filled with curiosity but, what if I told you that curiosity helps us better retain information. Would you believe me? Don't get me wrong, I consider myself very much an introvert with a tendency to pass up opportunities to ask questions, no matter who it is: my physician, friends and family, co-workers, the barista, just about everyone who directly (and indirectly) affects my life. I've always been accepting of having that "go-with-the-flow" attitude in life. It was time to shake things up. So, can I ask you a personal question: What are you doing today to Own your Tomorrow? It's a fairly simple and honest question that could very well kickstart your passion for a better tomorrow. When I became a wife and shortly after, a mother, I was filled with questions and concerns: "am I the best I can be? How can I make tomorrow better? " and "What are my strengths and am I utilizing them?" I had experienced a great deal of change and uncertainty. There I was with a stable 9-5 job complete with perks and benefits; but it wasn't long after until another question stirred within me, "Was this what I wanted?" After having had my second child, I had gone through the motions long enough and needed a change. Stat. 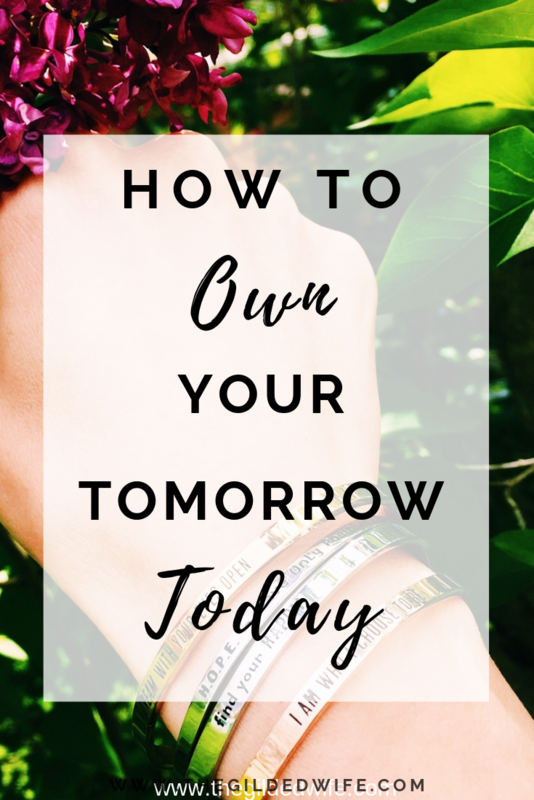 Filled with doubt and discouragement, it hit me: "Amy, what are you doing today to Own your tomorrow?" What am I doing today to better equip my tomorrow? I was eager to live more purposefully and intentionally. Being a communications major, I ached for an opportunity to utilize my skills in writing. My blog was exactly the tool I desired to kindle my passion and share my heart. I was building strong friendships within a trusted and loyal community of women, who I otherwise would've never met if it weren't for fervent prayer and an overwhelming sense of curiosity. THIS was it for me! The moment when the puzzle pieces fell into place. THAT moment when your fire is fueled with purpose and an unexplainable drive. What are you doing TODAY to OWN YOUR TOMORROW? Are you living a purposeful and fulfilling life, today? If not, what can you begin doing right where you are to benefit your tomorrow? THOUGHT: Why aren't you asking more questions? Ask questions. Awaken your passion. Invest in your tomorrow.